Process technology is important as the lower the process node, the more efficient the processor becomes, which leads to either longer battery life for the same tasks on battery powered devices, or allows for higher frequencies extracting more performance. Qualcomm and Samsung recently announced Snapdragon 835 SoC was manufactured using 10nm process technology, but Mark Bohr, an Intel Senior Fellow and director of process architecture and integration at Intel Corporation. wrote a blog post explaining that while in the past process node size and density were progressing in a “linear” fashion, this is not the case anymore, as marketing has changed, and some companies advance node names, even in cases where there’s minimal or no density increase. 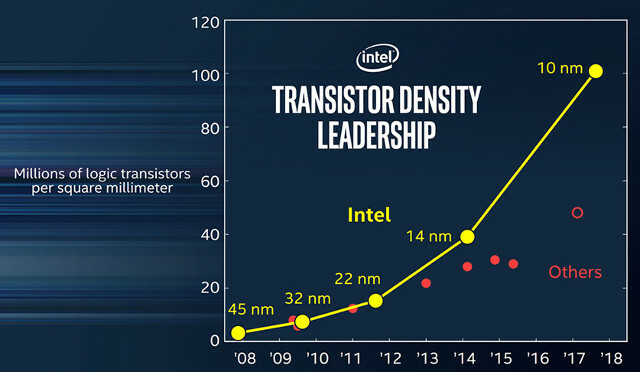 The chart above implies that some companies 10nm process is barely better than Intel’s 14 nm process, with their 10nm process capable of integrating about twice as much transistors per square millimeter compare to competitors’ 10nm process. Mark goes on to say a metrics are needed, and manufacturers should disclose their logic transistor density in units of MTr/mm2 (millions of transistors per square millimeter), using the following formula combining NAND and Scan Flip Flop (SFF) cell areas. He also explains SRAM cell size should be reported separately since there’s a wide variety of SRAM-to-logic ratios in different chips. Funny on how Intel insists that everyone use their metrics to measure density, which magically shows them slaughtering everyone else. The truth is a lot less positive for Intel and even if they still hold a lead, it’s not the overwhelming lead they bet their business on. Smaller feature size reduces capacitance which reduces switching currents and thereby saves power, but it increases leakage currents and thus increases power. Smaller feature are also more vulnerable to electromigration and other defect inducing problems. People use games consoles, TV boxes, tablets and phones, poor Intel. Another nonsense comment. Lately I see too many, and it is starting to be disgusting. Desktop computers will never ever dissapear. Their size will decrease? perhaps, but there’s a form factor system where you can choose which one you prefer. I use desktop computer since I work at one office as IT Manager, and I will allways buy desktop computers for the workers, and I guess most of my IT mates will continue doing so, since it’s the best option against crappy laptops. Laptops are for certain users who need mobility, but that’s about 5-10% of total workers. And that isn’t going to change anytime soon. For certain tasks I use small computers or even x86 mini computers, because they’re small and powerful enough to do automatic or monitoring tasks, perfect for those but not for heavy office work. The market for PC gaming, software & content creation and other heavyweight processing is still healthy though (and not going away any time soon, if ever), and that’s really where there’s a lot of need for high-end offerings. For those people, those new “fads” like mobile devices won’t cut it – they need a keyboard, a mouse and a lot of power. Most everyday users can probably get by with their smartphones, tablets and 10 year old PCs/laptops, since they mainly go for lightweight work and content consumption. The PC market is likely falling because of this – why do you need the latest i7, if your old clunky Core 2 Duo laptop (or 2 year old tablet, or new smartphone) works just as well for browsing, communication and videos?